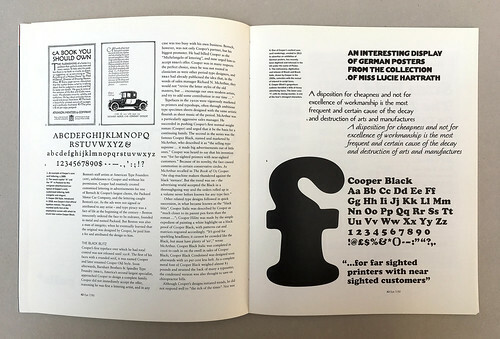 Cooper Black is one of the emblematic typefaces of the twentieth century. Who was the man behind the face? Every designer has used Cooper Black at least once in their professional lives. It’s a ritualistic experience as endemic to design as confirmation is to Christianity. Once one of the world’s most ubiquitous metal typefaces, Cooper Black is a truly twentieth-century type, as emblematic as Futura or Univers. While not the first type to have rounded serifs, It is the most authoritative and imposing of the so-called fat faces: as eye-catching as a charging bull and as expressive as carnival barker. 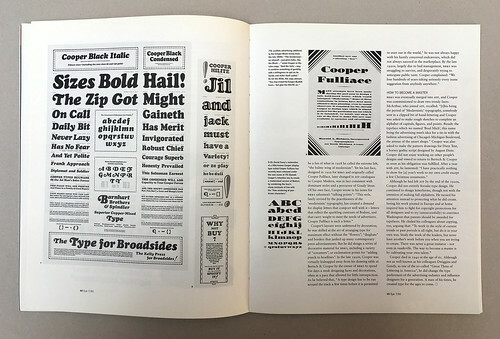 It has been influential too: had there never been a Cooper Black, the world might never have known Ultra Bodoni, one of the many behemoths designed to compete in the growing fat face market of the mid-1920s. Cooper Black has survived the phototype and digital revolutions, and since the 1950s has been a standard transfer type – but who knows the man behind the face? Oswald Cooper – Oz or Ozzie to his friends – was born in 1879, a native of Coffeeville, Kansas, who in his teens settled in Chicago, originally to study illustration, but eventually to become one of the leading practitioners of the Chicago Style. In the early 1920s and 1930s, American design was a melange of regional dialects, each emanating from a big city under the influence of one person’s style, or the confluence of a few. 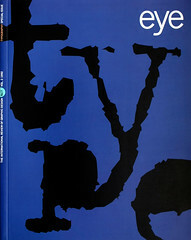 Lettering, typography and illustration were the defining media; advertising the primary outlet. The Boston Style was attributable to W. A. Dwiggins and the New York Style to Frederic W. Goudy (both of whom spent time in Chicago), while the Chicago (or Midwestern) Style was driven by Cooper, who combined calligraphic skill with typographic expertise to create press advertisements that were modern in character and classic in form. During the first two decades of the 1900s, most advertisements were illustrated and lettered by hand to achieve individuality within the bounds of convention. A successful commercial artist had to be either a smart salesperson or a skilled general practitioner, adept at the rather tedious art of lettering. The more versatile and imaginative the artist – and Cooper was both – the happier, and more forthcoming, the clients. Cooper stumbled into his lifelong vocation by accident. He left Kansas at the age of 18 to study illustration at the Frank Holme School of Illustration in Chicago, where he met Frederic W. Goudy, the most prolific of all American type designers and director of Holme’s typographic department. Goudy befriended Oz and helped him to earn his tuition fees by assigning him jobs setting type for correspondence course booklets: a happy career move, since Cooper soon realised that he had little talent for drawing pictures, but a real knack for the art of lettering. Soon he was appointed as a lettering teacher, and though the pay was poor, if he was paid at all, he enjoyed his work and the friends he made – maestro W. A. Dwiggins, cartoonist Harry Hirschfield, and, of course, Goudy. While teaching at Holme, Cooper met Fred Bertsch, who ran an art service agency next door to the school. Bertsch loved Cooper’s work, and in 1904 they entered into the perfect partnership: Bertsch, a consummate salesman, and Cooper, the gifted artist, formed Bertsch & Cooper with the goal of establishing a full service typeshop, including typesetting, layout, copywriting and design. To open a typeshop was an expensive business even then, so Bertsch & Cooper established their initial reputation through handlettering for small local jobs and later for large national campaigns. Eventually, their financial success allowed them to open the full service shop they had dreamed of, giving Cooper the opportunity to test his other talents. ‘Cooper, of course, had brilliant capacities as a craftsman in the field of printing and of advertising layout,’ wrote the typographer Paul Standard in The Book of Oz Cooper (The Society of Typographic Arts, Chicago, 1949). ‘But in his endowment was also a gift for language, and through its discipline a power of clear and forthright expression … [H]is text sought to persuade, not stampede.’ Bertsch & Cooper earned respect (and clients) because both partners understood the demands of the marketplace, yet practised the persuasive arts with integrity. Cooper stumbled into type design almost as accidentally as he had into lettering. His first type was drawn and cut in 1913 by one of Morris Fuller Benton’s staff artists at American Type Founders (ATF), unbeknownst to Cooper and without his permission. Cooper had routinely crated customised lettering in advertisements for one Bertsch & Cooper’s largest clients, the Packard Motor car Company, and the lettering caught Benton’s eye. As the ads were not signed or attributed to any artist – and type piracy was a fact of life at the beginning of the century – Benton innocently ordered the face to be redrawn, founded in metal and named Packard. But Benton was also a man of integrity; when he eventually learned that the original was designed by Cooper, he paid him a fee and attributed the design to him. Other related type designs followed in quick succession, in what became known as the ‘black blitz’. Cooper Italic was described by Cooper as ‘much closer to its parent pen form than the roman …’; Cooper Hilite was made by the simple expedient of painting a white highlight on a black proof of Cooper Black, with patterns cut and matrices engraved accordingly. ‘It’s good for sparkling headlines; it cannot be crowded like the Black, but must have plenty of “air”,’ wrote McArthur. 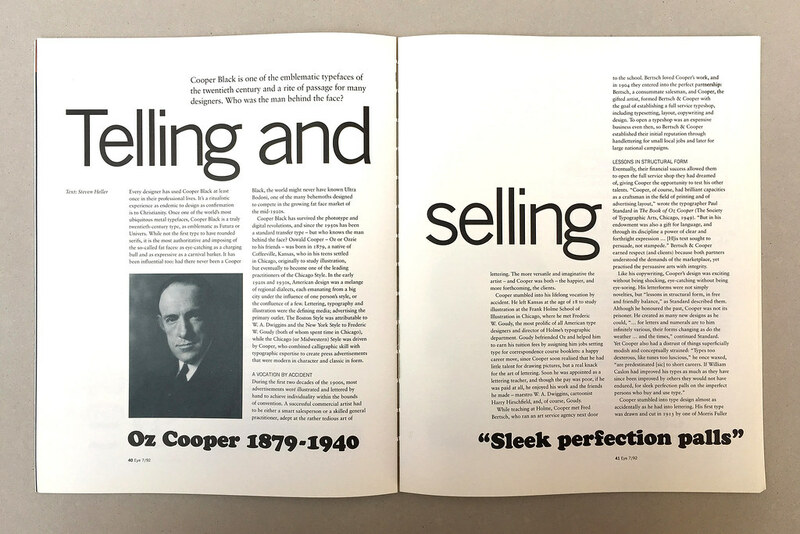 Cooper Black Italic was completed in 1926 to cash in on the swell in sales of Cooper Black; Cooper Black Condensed was designed soon afterwards with 20 per cent less heft. As a complete metal font of Cooper Black weighed almost 83 pounds and strained the back of many a typesetter, the condensed version was also thought to save on chiropractor bills. Cooper died in 1940 at the age of 61. Although not as well known as his colleagues Dwiggins and Goudy, as one of the so-called ‘Great Three of Lettering in America’, he did change the type preferences for a generation. A man of his times, he created type for the ages to come.